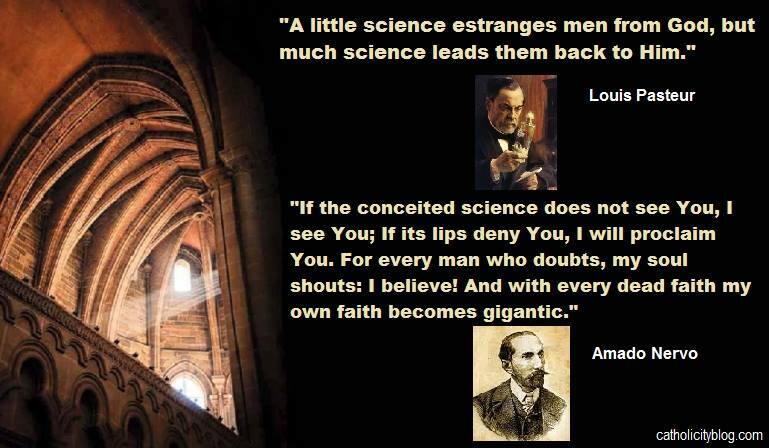 Let us see the views about God of a select group of scientists of the last century. It would be impossible to list all the greatest scientists of history that believed in God. http://www.catolicidad.com/2016/02/yo-creo.html Translated from Spanish by Fabiola Lozano. Father Amorth, the Italian translation of the new Ritual for Exorcists is finally ready. FATHER AMORTH: Yes, it is ready. Last year the CEI didn’t want to approve it because it contained errors in the translation from Latin to Italian. And we exorcists, the ones who would have to use it, we took the opportunity to point out that, on a number of points, we were in disagreement with the New Ritual. But the underlying Latin text has remained the same in this revised translation. This long-awaited Ritual has turned into a farce. An incredible obstacle that is likely to prevent us acting against the demon. A heavy accusation. What is it that you are thinking of? FATHER AMORTH: I will give you but two examples. Two spectacular examples. Point 15 treats of evil spells and how one should behave when dealing with them. An evil spell is an evil brought about on a person by means of recourse to the devil. It can be accomplished under a variety of forms like spells, curses, the evil eye, voodoo and macumba. The Roman Ritual used to explain how one should confront it. The New Ritual on the other hand categorically declares that it is absolutely forbidden to perform exorcisms in such cases. Absurd. Evil spells are by far the most frequent causes of possessions and evil procured through the demon: at least 90% of cases. It is as good as telling exorcists they can no longer perform exorcisms. Then Point 16 solemnly declares that one should not carry out exorcisms if one is not certain of the presence of the devil. This is a masterstroke of incompetence: the certainty that the devil is present in someone can only be obtained by carrying out an exorcism. What is more, the authors of the Ritual failed to notice that on two points they were contradicting the Catechism of the Catholic Church. For this points out that exorcism should be practiced in cases of diabolical possession and in those of evil caused by the demon. And it also recommends that it be performed on people as well as on things. And in things, there is never the presence of the demon, there is only his influence. The declarations contained in the New Ritual are very serious and very damaging. They are the fruit of ignorance and inexperience. But wasn’t the New Ritual put together by specialists? FATHER AMORTH: Not at all! During these last ten years, two commissions worked on the Ritual; one which was made up of cardinals and which was responsible for the Praenotanda, that is to say the initial provisions, and the other which was responsible for the prayers. I can affirm with certainty that none of the members of these commissions had ever performed an exorcism, had ever been present at an exorcism and ever possessed the slightest idea of what an exorcism is. Here lies the error, the original sin of this Ritual. Not one of those who collaborated on it was an exorcism specialist. FATHER AMORTH: It is not me you should be asking. At the Vatican II Ecumenical Council, each commission was aided by a group of experts who assisted the bishops in their work. And this custom was kept up after the Council, every time that parts of the Ritual were redrafted. But not this time. And yet, if there were ever a subject that demanded the participation of specialists, it was truly this. FATHER AMORTH: And yet we exorcists were never consulted. And what is more, any suggestions that we were able to make were unfavourably received by the commissions. It is a paradoxical history. Do you want me to tell you what happened? FATHER AMORTH: As Vatican Council II had requested, the various parts of the Roman Ritual were gradually revised. We exorcists were waiting for title 12 to be addressed, that is to say the Exorcism Ritual. But apparently this Ritual was not considered an important subject, for the years went by and nothing happened. Then, quite unexpectedly, on 4 June 1990, there was published a Ritual ad interim, that is a trial Ritual. This was a real surprise for us, as we had not been consulted beforehand. And yet we had prepared a whole series of requests in view of the Ritual’s revision. We were asking, among other things, that the prayers might be amended so that invocations to the Virgin, which were completely absent, might be incorporated, and that the number of prayers specifically relating to exorcism might be augmented. But we were not given the chance to make any kind of contribution. However, we were not discouraged: after all the text had been drawn up for us. And as in his letter of presentation, the Prefect of the Congregation for Divine Worship at the time, Cardinal Eduardo Martinez Somalo, had asked the Episcopal Conferences to send in, over the following two years, "any advice and suggestions made by priests who would make use of it", we got down to work. I brought together eighteen exorcists, chosen from among the most expert on the planet. We examined the text with great attention. We used it. We immediately commended the first part in which the evangelical foundations of exorcism were summarized. This part deals with the biblical and theological aspect of the question, and on this head no lack of competence was apparent. It is a new section not found in the Ritual of 1614, which was composed under Pope Paul V; besides, at that time, there was no need to recall these principles, since the whole world knew them and accepted them. Today, on the contrary, this is indispensable. How were your observations received? FATHER AMORTH: Badly, and they achieved nothing. We had taken our inspiration from the dogmatic constitution Lumen gentium in which the Church is described as the "People of God". In number 28, it speaks of priests collaborating with bishops, and in number 37 it is clearly stated - and this applies to the laity also - that "by reason of the knowledge, competence and preeminence they enjoy, they are empowered, indeed sometimes obliged, to manifest their opinion on things that pertain to the good of the Church." This is exactly what we did. And we were ingenuous enough to think that the directives of Vatican II had found their way into the Roman Congregations. But instead we found ourselves up against a wall of rejection and derision. The Secretary of the Congregation for Divine Worship gave a report to the Commission of Cardinals in which he said that those who had contacted him were bishops and not priests and exorcists. And with regard to our own humble attempt to help them by giving our advice as specialists, he added - and I quote verbatim - "One should also take note of the fact that a group of exorcists and "demonologues", who subsequently formed themselves into an international Association, were busy orchestrating a campaign against the rite." An indecent accusation: we have never orchestrated a campaign! The Ritual was intended for us, and yet not one competent person had been called upon by the commissions; so it was only to be expected that we should seek to make our contribution. Does this mean then that, for you, the New Rite is unusable in the struggle against the demon? FATHER AMORTH: Yes. They were looking to give us a blunt weapon. Efficacious prayers, prayers that had been in existence for twelve centuries, were suppressed and replaced by new ineffective prayers. But, as luck would have it, they threw us a lifeline at the last moment. 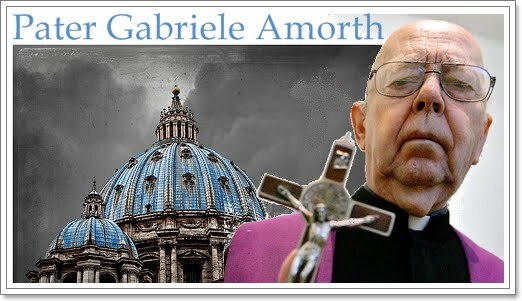 FATHER AMORTH: The new Prefect of the Congregation for Divine Worship, Cardinal Jorge Medina, attached to the Ritual a Notification in which he specified that exorcists were not obliged to use this Ritual and that, if they wished, they could ask their bishop for authorization to use the old one. The bishops must in their turn ask for authorization from the Congregation which, as the Cardinal writes, "willingly accords it". FATHER AMORTH: Do you want to know where it comes from? It comes from an attempt made by Cardinal Ratzinger, the Prefect of the Congregation for the Doctrine of the Faith, and by Cardinal Medina to introduce into the Ritual an article - it was article 38 at that time - which would authorize exorcists to use the previous Ritual. It was undoubtedly a manoeuvre in extremis to fend off on our behalf the grave errors found in the definitive Ritual. But the two cardinals failed in their attempt. Then Cardinal Medina, who had understood what was at stake in this matter, decided to grant us this lifeline anyway and he added a separate note. How do you exorcists see your position within the Church? FATHER AMORTH: We are very badly treated. Our brother priests who are charged with this delicate task are treated as though they are crazy, as fanatics. Generally speaking they are scarcely even tolerated by the bishops who have appointed them. And the most striking manifestation of this hostility? FATHER AMORTH: We organized an international congress of exorcists near Rome. We asked to be received by the Pope. To avoid pressurizing him and adding yet another audience to those he had already granted, we simply asked to be received in a public audience, that of Wednesday in Saint Peter’s. We were not even asking him to address us his personal greetings. We made our request for an audience in the proper manner, as will be perfectly recalled by Mgr. Paolo de Nicolo of the Prefecture of the Pontifical House, who received our request very warmly. But on the day before the audience, Mgr Nicolo told us - to tell the truth, he was very embarrassed and it was very apparent that the decision did not depend on him - not to present ourselves at the audience, and that we had not been admitted. Unbelievable: 150 exorcists from five continents, men appointed by their bishops in accordance with the rules of canon law which requires that they be men of prayer, knowledge and good reputation - and thus in some way the cream of the clergy - ask to take part in a public audience with the Pope and are shown the door! Mgr Nicolo told me, "I promise to immediately send you a letter explaining the situation." Five years have passed and I am still waiting for this letter. It [was] certainly not John Paul II who excluded us. But the fact that 150 priests should be forbidden to take part in a public audience with the Pope in Saint Peter’s shows what kind of obstacles exorcists encounter even within their own Church and to what extent they are frowned upon by a great number of ecclesiastical authorities. You fight against the demon every day. What is Satan’s greatest success? FATHER AMORTH: To succeed in making people believe that he doesn’t exist. And in this he has almost succeeded. Even within the Church. We have a clergy and an episcopate who no longer believe in the devil, in exorcisms, in the extraordinary evil that the devil can cause, nor in the power that Jesus has given us to drive out demons. For three centuries, the Latin Church - in contrast with the Orthodox Church and various Protestant confessions - has almost entirely abandoned the ministry of exorcism. As the clergy no longer practice exorcisms, as they no longer study them and have never seen them, they no longer believe in them. And nor do they believe in the devil either. We have entire episcopates who are hostile to exorcisms. There are countries in which there is not a single exorcist, as for example Germany, Switzerland, Spain and Portugal. A terrifying deficiency. You did not mention France. Is the situation any different there? FATHER AMORTH: There is a book written by Isidore Froc, the best known French exorcist, entitled: Exorcists, who are they and what do they do? This work, translated into Italian, was written at the request of the French Episcopal Conference. Nowhere in this book is it stated that exorcists, in certain cases, perform exorcisms. And the author has several times stated on French television that he has never performed an exorcism and that he would never do so. Out of a hundred French exorcists, there are but five who believe in the devil and carry out exorcisms. All the rest send those who contact them to the psychiatrist. And the bishops are the main victims of this situation of the Catholic Church in which belief in the existence of the demon is in the process of disappearing. Before this new manual appeared, the German episcopate sent a letter to Cardinal Ratzinger in which they declared that there was no need to create a new Ritual because exorcisms should no longer be performed. Is it down to the bishop to appoint exorcists? FATHER AMORTH: Yes. When a priest is appointed bishop, he is faced with an article in the Code of Canon Law which gives him absolute authority to appoint exorcists. The minimum one can ask of a bishop is that he has taken part in at least one exorcism, given that he has to make such an important decision. Unfortunately, this is almost never the case. But if a bishop finds himself before a serious request for an exorcism - that is to say one that has not been made by someone deranged - and he does nothing, he commits a mortal sin. And he is then responsible for the terrible sufferings endured by this person. Sufferings which sometimes last for years or even an entire lifetime, and which he could have prevented. Do you mean to say that the majority of the bishops in the Catholic Church are in a state of mortal sin? FATHER AMORTH: When I was a child, my old parish priest taught me that there are eight sacraments: the eighth is ignorance. And the eighth saves more than all the others together. To commit a mortal sin, there must exist grave matter, but also full awareness and deliberate consent. To fail to give one’s aid is, for bishops, a grave matter. But these bishops are ignorant: there is therefore no deliberate consent and full awareness. But if one does not believe in the existence of Satan, does one’s faith remain intact, is it still the Catholic faith? FATHER AMORTH: No. I will tell you a story. When I met Don Pellegrino Ernetti for the first time, a celebrated exorcist who had practiced in Venice for forty years, I said to him, "If I could speak to the Pope, I would tell him that I meet too many bishops who do not believe in the devil." The following afternoon, Father Ernetti came back to see me to tell me that that same morning he had been received by John Paul II. "Holiness," he had said to him, "there is an exorcist here in Rome, Father Amorth who, if he met you, would tell you that he knows too many bishops who do not believe in the devil." The Pope answered him briefly: "He who does not believe in the devil does not believe in the Gospel." That is the reply which was given to him and which I repeat. Explain to me if you would: does this mean that there are many bishops and priests who are no longer Catholic? FATHER AMORTH: Let us say that they do not believe in a Gospel truth. Therefore, I would possibly accuse them of propagating a heresy. But let us understand: someone is only formally heretical if he is accused of committing an error and he persists in it. But because of the situation in the Church today, no one would ever accuse a bishop of not believing in the devil or in demonic possession and of not appointing exorcists because he has no belief in these things. I could mention a great number of bishops and cardinals who, as soon as they had been appointed to a diocese, withdrew from all exorcists the faculty of exercising their powers. Or of bishops who openly maintain: "For myself, I do not believe in these things. They are beliefs of the past." Why is this? Because unfortunately there has been an extremely pernicious influence exerted by certain biblical experts, and I could mention the names of some very well-known people. We who every day come into close contact with the world beyond, we know that this influence has had a hand in many of the liturgical reforms. FATHER AMORTH: Vatican Council II had asked for certain texts to be revised. But this order was disobeyed, as there was a desire to rewrite them all from scratch. No thought was given to the possibility of making things worse rather than better. And many rites were spoiled by this mania for jettisoning everything from the past and of rebuilding everything from top to bottom, as though the Church had, until today, hoodwinked and misled us, and as though there had now finally arrived a time of great geniuses, of super-theologians, of super-biblicists, of super-liturgists, who knew how to give the Church what was sound. It is all a lie: the last Council simply asked for these texts to be revised, not to be destroyed. The Exorcism Ritual, for example, was to be revised, not rewritten. There were prayers in it which had been in use for twelve centuries. Before suppressing these ancient prayers which had proved so efficacious, one should have thought long and hard. But no! We exorcists have all tried out the new prayers in the New Ritual ad interim and we have come to realize that they are absolutely ineffectual. But the rite of baptism for children has also been spoiled. It has been so drastically overhauled that the exorcism against Satan has virtually been eliminated. This had always held a very great importance for the Church, so much so that it is called the minor exorcism. Paul VI himself publicly protested against this new rite. We find the same degeneration of the rite in the new benedictionary. I have read its 1200 pages minutely. Well! any reference to the fact the Lord must protect us against Satan, that the angels protect us from the attacks of the demon, has been systematically suppressed. All the prayers for the blessing of homes and schools have been suppressed. Everything should be blessed and protected, but today there is no longer any protection against the demon. There no longer exists any defense or any prayers against him. This same Jesus had taught us a prayer for liberation in the Our Father: "Deliver us from the Evil One. Deliver us from the Person of Satan." This prayer has been mistranslated and today people pray saying, "Deliver us from evil." One speaks of a general evil whose origin is essentially unknown. But the evil against which Our Lord Jesus taught us to fight is, on the contrary, a concrete person: it is Satan. You are in a privileged observation position: is it your impression that Satanism is spreading? FATHER AMORTH: Yes. Enormously. When the faith retreats, superstition makes progress. In biblical terms, I can say that people are abandoning God to give themselves up to occultism. The terrible retreat of the faith throughout the whole of Catholic Europe makes people throw themselves into the arms of magicians and fortunetellers, and satanic sects prosper. Devil worship is the object of great publicity among the masses through satanic rock and celebrities like Marilyn Manson. Children are also under attack: there are magazines and comic strips that teach magic and Satanism. Spiritualist seances in which the dead are called up to answer certain questions are very widespread. People are now being taught to perform spiritualist seances through the computer, the telephone, the television, the video recorder, but above all through automatic writing. No longer is there a need for a medium: this is a spiritualism that each can practice by himself. According to polls, 37% of students have on at least one occasion played the game with letters and a glass, which is a veritable spiritualist seance. In a school where I had been invited to speak, the students told me that they used to play this game during the religion lesson, under the obliging eyes of the teacher. FATHER AMORTH: There is no difference between white magic and black magic. When magic works, it is always the work of the demon. Every form of occultism, like this widespread resort to the religions of the East with their esoteric suggestions, are open gateways to the demon. And the devil enters. At once. In the case of the Sister who was killed at Chiavenna and in that of Erika and Omar, the two adolescents from Novi Ligure who killed Erika’s mother and little brother, I had no hesitation in stating immediately that diabolical intervention was involved, because these children had given themselves up to Satanism. The police inquiry subsequently showed that they were following Satan, that they had satanic books. How does the demon set about seducing people? FATHER AMORTH: His strategy is always along the same lines. I have told him this and he admits it. He makes people believe that hell does not exist, that sin does not exist, and that he is nothing but one more experience to try out. Concupiscence, success and power are the three great passions on which Satan relies. How many cases of demonic possession have you encountered? FATHER AMORTH: About a hundred. I have stopped counting. A hundred? But that is an enormous number. In your book you say that cases of possession are rare. FATHER AMORTH: And indeed they are. Many exorcists have encountered nothing but cases of diabolical harm. But I have inherited the "clientele" of a famous exorcist, Father Candido, and therefore cases which he had not as yet resolved. Moreover, exorcists send me their more resistant cases. What is the most difficult case you have ever met? FATHER AMORTH: It is one I am "treating" at this moment, and that for two years now. It is the young girl who was blessed - it was not a true exorcism - by the Pope in October, at the Vatican, and whose case caused a great stir in the press. She is buffeted twenty-four hours a day and is the victim of unspeakable torments. The doctors and psychiatrists can make nothing of this. She is completely lucid and very intelligent. A truly sad case. How does one become a victim of the demon? FATHER AMORTH: One can be subjected to the attacks of the demon in four cases. Either because it constitutes a blessing for the person and such is the case with many of the saints, or because of irreversible persistence in sin, or because one is the victim of a curse uttered in the name of the demon, or else when one gives oneself up to practices of occultism. During the exorcism of possessed persons, what kind of phenomena occur? FATHER AMORTH: I recall an illiterate peasant who, during an exorcism, spoke to me only in English and I had to have an interpreter. There are people who manifest a superhuman strength, others who completely levitate from the ground and whom it is impossible even for several men to keep seated in their armchair. But it is only the context in which these phenomena occur which makes us speak of demonic possession. Has the devil ever harmed you personally? FATHER AMORTH: When Cardinal Poletti asked me to take on this role of exorcist, I recommended myself to the Virgin: "Envelop me in Thy mantle and I will be in total security." The demon has often threatened me, but he has never harmed me. Don’t you ever feel afraid of the demon? FATHER AMORTH: Me, of that animal? It is he who should be afraid of me; I act in the name of the Lord of the world. But as for him, he is nothing but God’s monkey. Satanism is spreading more and more widely. The New Ritual, in practice, prevents the carrying out of exorcisms. Exorcists are prevented from taking part in an audience with the Pope in Saint Peter’s. Tell me frankly: what is going on? FATHER AMORTH: The smoke of Satan has entered everywhere. Everywhere! Perhaps we were excluded from the audience with the Pope because they were afraid that such a large number of exorcists might succeed in chasing out the legions of demons that have installed themselves in the Vatican*. FATHER AMORTH: It may seem like a joke, but I do not believe it is. I have no doubt about the fact that the demon tempts the authorities of the Church especially, just as he tempts every authority, those of politics and industry. Are you saying then that here as well, as in all wars, Satan wishes to conquer the enemy’s stronghold in order to take the enemy generals prisoner? FATHER AMORTH: It is a winning strategy. It is one that is always applied. Especially when the adversary’s defenses are weak. Satan is also attempting it. But, thank Heaven, it is the Holy Spirit who directs the Church: "The gates of hell will never prevail." Despite the defections. And despite the betrayals, about which one should not be surprised. The first betrayal was the work of one of the closest Apostles of Jesus: Judas Iscariot. Yet, despite this, the Church continues on her way. The Holy Spirit keeps her going and that is why Satan’s attacks can only be partially successful. Admittedly, the demon may win battles, and even important battles. But never the war. This interview was originally published in the June 2000 issue of the Italian magazine 30Giorni, and despite the time that has passed since it was published, the issue is as topical as it was before. http://www.catolicidad.com/2009/06/impactantes-declaraciones-del-exorcista.html Translated from Spanish by Fabiola Lozano. Towards the mid-1960s, this practice was introduced, without authorization in some countries of Europe, especially those of Protestant majority, in an act of indiscipline and individualism, and contrary to the prevailing law. Nevertheless, the Constitution on the Sacred Liturgy allowed the new practice in Germany (6/7/1968) and in Belgium (11/7/1968), but in view of the strong protests against the tactic of accepting “faits accomplis”, the Pope suspended the concession on July 25 of the same year. of Christ and any other food. (This Instruction, composed by special mandate of the Holy Father Paul VI, was duly approved by him with the force of the Apostolic authority on May 28, 1969 – the numbering corresponds to that of the Enchiridion Vaticanum, volume 3). 1277 This method of distributing Holy Communion in which the minister himself places the consecrated Host on the tongue of the communicants must be retained, not merely because it has many centuries of tradition behind it, but especially because it expresses the faithful’s reverence for the Eucharist. 1278 Furthermore, the practice which must be considered traditional, more effectively ensures that Holy Communion is distributed with the proper respect, decorum and dignity. It removes the danger of profanation of the sacred species, in which "in a unique way, Christ, God and man, is present whole and entire, substantially and continually". Lastly, so that the care of the fragments of the Consecrated Bread that the Church has always recommended be always preserved: "What you have allowed to drop, think of it as though you had lost one of your own members." The danger of a loss of reverence for the August Sacrament of the altar. Profanation of the Holy Sacrament. Adulteration of the true doctrine. Therefore, taking into account the remarks and the advice of those whom "the Holy Ghost has placed to rule over" the churches, in view of the gravity of the matter and the force of the arguments put forward, the Holy Father has decided not to change the existing way of administering Holy Communion to the faithful. The Apostolic See therefore emphatically urges bishops, priests and laity to carefully obey the law which is still valid and which has again been confirmed (i.e. communion placed directly in the mouth). “Communion in the hand was introduced without authorization; Paul VI tenaciously opposed allowing it but decided to grant an indult only where its use was firmly established and this with the purpose of “helping the Episcopal Conferences to comply with their pastoral work, frequently more difficult than ever because of the present situation.” (CM, p. 118). The purpose of the indult was not to abolish Communion on the tongue. “A good is not conceded but rather something that is, in itself, MUCH MORE IMPERFECT (Communion in the hand) than the general law in force (Communion on the tongue). This concession is due to the prudential decision of tolerating a dangerous practice in order to avoid a greater evil (generalized disobedience).” (CM, p. 126). How grievous it should have been for Pope Paul VI to grant this indult, against his better judgment, for those who ignoring his exhortation DID NOT WANT TO SUBMIT TO THE EXISTING AND CONFIRMED LAW! In doing so, did he remember the following words spoken by Saint Pius X in similar circumstances? “… devout sons of the Pope are only those who obey his words and follow him in everything, and not the others who try to dude his orders with stubbornness worthy of a better cause, in order to obtain exemptions and dispensations which are as painful to us as they are dangerous and scandalous to the Church." The texts taken from the book Communion in the Hand, exceptional work by Mgr Juan Laise, Bishop Emeritus of San Luis, who remaining faithful to the tradition prohibited in his Diocese the new praxis, are identified by the symbol ‘CM’. (Consistorial allocution, Il Grave Dolore (3), May 24, 1914). The Council of Constantinople (691) Prohibited the faithful from giving Communion to themselves (which is what happens when the Sacred Host is placed in the hand of the communicant). It decreed an excommunication of one week’s duration for those who would do so in the presence of a bishop, priest or deacon. Council of Trent (Dogmatic Council, October 11, 1551), (ses. XIII, c.8) “The unvarying practice of the Church has always been, that the faithful receive the Sacrament from the hand of the priest, and that the priest communicate himself; this practice is always to be scrupulously adhered to, stamped, as it is, with the authoritative impress of Apostolic tradition, and sanctioned by the illustrious example of our Lord himself, who, with His own hands, consecrated and gave to His disciples, His most sacred body.” (The text referred to Communion in the mouth, because Communion in the hand had been forbidden several decades ago). Second Vatican Council: Did not adopt a position on this matter. Saint Hippolytus (170-235) “… All shall be careful… that any of it falls and is lost. For it is the Body of Christ, to be eaten by those who believe, and not to be scorned.” (Trad. Ap. 32.). Origen (185-254) “… Know how, when you receive the Body of the Lord, you hold it with every precaution and veneration lest any of the consecrated gifts should fall. For you believe, and rightly believe, yourselves guilty if through your negligence any of it should be dropped.” (De lapsis, ch. 15, in Smith, The Sacrament of the Eucharist, 853). Pope Paul VI himself observes on the latter text the following: “The faithful thought themselves guilty, and rightly so, as Origen recalls, if after they received the Body of the Lord in order to preserve it with all care and reverence, a small fragment of it fell off through negligence.” (Mysterium Fidei, 32). Saint Basil (330-379): Says clearly that to receive Communion by one’s own hand is only permitted in times of persecution or, as was the case with monks in the desert, when no deacon or priest was available to give it. “It is not necessary to show that it does not constitute a grave fault for a person to communicate with his own hand in a time of persecution when there is no priest or deacon” (Letter 93, my emphasis). The text implies that to receive it in the hand under other circumstances, outside of persecution, would be a grave fault. Saint Leo the Great, Pope between 440-461, already in the fifth century, is an early witness of the traditional practice. In his comments on the sixth chapter of Saint John’s Gospel, he speaks of Communion in the mouth as the current usage: “We receive by means of the mouth which we believe by means of faith”. The Pope does not speak as if he were introducing a novelty but as if this were a well-established fact. Saint Gregory, also called the Great, Pope between 590 and 604. In his dialogues (Roman 3, c. 3) he relates how Pope St. Agapetus performed a miracle during the Mass, after having placed the Body of the Lord into someone’s mouth. We are also told by John the Deacon of his Pope’s manner of giving Holy Communion. Saint Francis of Assisi (1182 – 1226) “They alone (priests) must administer, and not others.” (Second letter to all the faithful). Saint Thomas Aquinas (1225 – 1274) “Out of reverence towards this sacrament, nothing touches it, but what is consecrated; hence the corporal and the chalice are consecrated, and likewise the priest's hands, for touching this sacrament.” (Theological Summa Pt. III, Q.82, Art. 3). Therefore it constitutes an irreverence towards this Holy Sacrament whenever It is touched by hands that are not consecrated; this doctrine was confirmed by H.H. John Paul II in Domenicae Cenae. When Pope Saint Pius X was on his death bed in August 1914, and Holy Communion was brought to him as Viaticum, he did not and was not allowed to receive it in the hand: he received it on the tongue according to the law and practice of the Catholic Church. 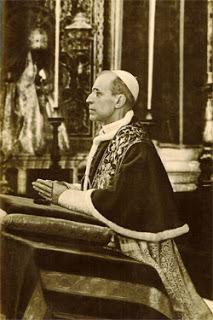 Pope Pius XII: “The temerity and daring of those who introduce novel liturgical practices, or call for the revival of obsolete rites out of harmony with prevailing laws and rubrics, deserve severe reproof.” (Mediator Dei, 17). - Pleasing? It is not pleasing to me at all! The instruction Memoriale Domini clearly quotes Saint Cyril affirming that this care desired by him (and the other Holy Fathers), is seen to be much more effectively guaranteed by Communion in the mouth, as this “assures more effectively that Holy Communion be distributed with the reverence, decorum and dignity due to it, so that every danger of profaning the Eucharistic species be removed and in order to guard with diligent carefulness as the Church has always recommended in relation to the fragments themselves of the Consecrated Bread.” (MD – 1278). The word “sacred” means separated, inaccessible, untouchable. However, “profane” means the opposite, that is, devoted to that which is not sacred, touchable, manipulable. Therefore Communion in the hand implies that God, who is worthy of all worship and reverence, is to be touched in a manner that is perhaps improper. And to avoid misinterpretations of the aforementioned words, three months later, in front of French television cameras, he denied Communion in the hand to Giscard d’Estaing’s wife, who was at the time First Minister of France. The Second Vatican Council establishes that the faithful “are permitted and sometimes even obliged to express their opinion on those things which concern the good of the Church.” (L. G. 37). In a clear demonstration of an “anti-council spirit”, in the Republic of Argentina the opinion of the laity was not requested, consequently they were taken aback by the introduction of a practice that was entirely foreign to them. “If the introduction of Communion in the hand is without a doubt a sign of growth in the ecclesiastical life, if it is a motive for joy to return to this genuine tradition or if it cannot be affirmed or prioritized that one manner is better than the other, it is not understood why in 1968 Paul VI did not think it opportune to change the manner received and used for a long time of how to give Communion and he vehemently exhorted to submit to this disposition; and much less is it understood why John Paul II in 1996 maintains the said dispositions as a norm. If the affirmation of El Pan vivo (The Living Bread) and Fundamentos are true, then Paul VI committed a grave mistake in not allowing the richness of this rite to be rediscovered. Furthermore, the strict forbiddance of the 10th Century which was maintained for almost a millennium was an error as it pretended to eradicate forever something valuable that we have just recently rediscovered, and this only, thankfully, to the indult. The answer is that the new practice has not been desired by the Holy See, nor is it part of the post-council liturgical reform but rather has only been permitted due to the unyielding insistence of some episcopal conferences (especially in Protestant countries); and this only after a completely abusive introduction which was not possible to resist, in spite of the complaints and prohibitions from Rome.” (CM, p. 135). “By the end of 1968, the Holy See made a consultation to the bishops of the world with regards to the subject of Communion in the hand. More than a third saw the possibility with approval. In 1969, the Instruction Memoriale Domini established that, where deemed convenient by the Episcopal Conferences, the faithful could have the liberty to receive Communion in the hand.” (p. 16). “To say that more than a third saw the possibility with approval, when MD says from the responses received it is clear that the vast majority of bishops believe that the present discipline should not be changed, is to adulterate the historic reality and Paul VI’s way of thinking. But to affirm that the Instruction Memoriale Domini established that, where the Episcopal Conferences considered it convenient with more than two thirds of their Bishops votes, that the faithful could have the liberty to receive Communion in the hand, is to fall short of the truth. What MD established was that the law that determined that Communion should be given only in the mouth of the faithful continued in force and without changes. It is true that it conceded an indult, not where the Episcopal Conferences deemed convenient, but where the practice had already been rooted, under certain conditions.” (MD  and ). Consequently, in 1996, the indult for Argentina should not have been requested, for it was a country where the faithful, in union with such a revered tradition and the Universal Law confirmed by the Pope, received Communion in the mouth. Because it is a sign of the reverence of the faithful toward the Eucharist. (1277 – Memoriale Domini). Because this manner of communicating gives more effective assurance that Holy Communion will be distributed with the appropriate reverence, decorum, and dignity; and that any danger of profaning the Eucharistic species will be avoided. (1278 – Memoriale Domini). Thus the Catholic doctrine runs the risk of “protestantizing” itself. Because whoever receives Communion in the hand is using an indult, that is an exception from the Universal Law of the Church; and rejecting the vehement exhortation of Paul VI, who commanded to submit diligently to the law that had been confirmed by him and was still in force. (1281 – Memoriale Domini). Because whoever receives Communion in the mouth not only follows exactly the tradition handed down but also the wish expressed by the last Popes and thus avoids placing himself in the occasion of committing a sin by negligently dropping a fragment of the Body of Christ. The Pope does not accept the practice, but gives the possibility of disagreeing: those who do not follow (it) do so legally but against the wish of the Holy Father. (CM pg. 133). Because according to the Congregation of the Divine Worship “In dioceses where it is allowed to distribute Communion in the hands of the faithful, a priest or extraordinary ministers of Holy Communion may not restrict communicants to receive Communion only in their hands, not on the tongue. Therefore, those who restrict communicants to receive Holy Communion only on in the hands are acting against the norms. Let all remember that the time-honored tradition is to receive the host on the tongue. The celebrant priest, if there is a present danger of sacrilege, should not give the faithful communion in the hand, and he should make them aware of the reason for way of proceeding.” (Adoremus Bulletin, April, 1999). “As of all the sacred mysteries bequeathed to us by our Lord and Saviour as most infallible instruments of divine grace, there is none comparable to the most Holy Sacrament of the Eucharist; so, for no crime is there a heavier punishment to be feared from God than for the unholy or irreligious use by the faithful of that which is full of holiness, or rather which contains the very author and source of holiness.” (Roman Catechism of the Council of Trent, Part II, chapter 4). Communion in the hand is the result of disobedience to the laws of the Church. 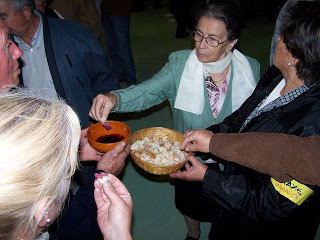 We must always bear in mind that receiving Communion in the mouth is the current law and that Communion in the hand is “only an indult”, a special license introduced in order to not leaving outside of the Church those who had abusively initiated this practice, which leads towards the desacralization of the Holy Sacrament and contradicts the rules of the Church. Sadly, this ushered in an unprecedented novelty: the introduction of the principle of disobedience as a source of law. Undoubtedly, despite good intentions, this practice has proven how ill-advised this principle is, as well as the indult. Not only were the modernists not restrained in their disobedience, who in an act of rebelliousness were already practicing Communion in the hand before the indult was granted, but after it they continued to introduce new elements that were contrary to the liturgical norms as well as doctrines contrary to the dogmas defined by the Church. After a while the use of the concession became widespread in other countries and places where it was not customary. As a result the cure was worse than the original problem. Disobedience as a source of law is a terrible principle, because those who are disobedient and rebels will always demand for more things. Modernists will never be satisfied with what they have achieved. Rebelliousness is not restrained through permissiveness. Facts have proved that instead of curbing the proliferation of evil, the latter multiplies. Furthermore, the theoretical permission is in reality a practical prohibition, since the instruction REDEMPTIONIS SACRAMENTUM states that: “if there is any danger of profaning the Eucharistic species, Communion in the hand will be avoided.” There is a constant danger in the case of Communion in the hand (virtually impossible to prevent it from happening), but no one listens to the orders of the Church: everybody turns a deaf ear to her rules. Besides, nothing good can come of exercising an exception that ushered in rebellion as a source of law and allowed desacralization. Never, for any reason whatsoever, receive Communion in the hand, due to the danger of sacred particles of the Host (where Christ is really present with all His Body, Blood, Soul and Divinity) being left in your hand. 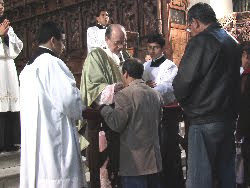 These particles will fall to the ground or elsewhere, since the layperson does not cleanse his/her hands as the priest does, or should do, at the end of the liturgy, also their hands are not consecrated. In addition, this practice has proved to facilitate the stealing of Consecrated Hosts by Satanist groups who use them in order to profane them; situation that has been denounced by Rome. Furthermore, it enables sacrileges as the ones we see in this video -in spanish- (Click HERE). Due to all the above, let us not contribute in any way to this practice that enables all kinds of profanations, desecrations and irreverences. Sources: YouTube (video) and Panorama Católico (text). http://www.catolicidad.com/2012/08/video-acerca-de-la-comunion-en-la-mano.html Translated from Spanish by Fabiola Lozano. RECEIVING COMMUNION WITHOUT GOING TO CONFESSION?